Lawyer Jack Bryant retires early to Fort Worth to kick back, relax and watch his son play football at TCU. Bored with retirement he opens a pro bono office in his RV. When Jack finds an elderly widow at his doorstep, clutching a check for life insurance proceeds on her husband but payable to his former employer, Jack files a civil suit to collect the benefits rightfully due the widow. A seemingly accidental death of his client’s husband thrusts Jack into a vortex of serial killings. He and his new love interest find themselves targets in the same murder for hire scheme. To stop the killings Jack must unravel what in their past makes certain people worth more dead than alive. Jack went down a step and extended his hand to assist his visitor, then offered her something to drink. June perched on the edge of the cushioned bench that circled the table. “Water would be nice,” she said in a soft voice. Jack went to the refrigerator and returned with a bottle. He twisted the cap a half a turn and handed it to her. She twisted the cap the rest of the way, took a small sip, replaced the cap and set it on the table. She reached into her purse and retrieved an envelope which she slid across the table to Jack. Jack picked up the envelope. The return address was the United States Postal Service. He opened it and found another envelope, this one torn and mangled with the addressee illegible. The letter from the postal service read, Dear Mrs. Davis: One of our sorting machines jammed and mangled this letter. We apologize for the problem. Your name was the only one we could make out on the letter, and we were able to get your address. Please handle as you see fit. Very truly yours. Jack looked at the mangled letter. It was from Euro Life Insurance Company, based on the Isle of Gibraltar. It stated that Euro had determined that one William Davis was married to June Davis. Under the terms of the policy, since it paid double indemnity in the event of an accidental death, the benefit was $400,000, payable to Allison Southwest. Jack looked through the documents a second time before he looked up. 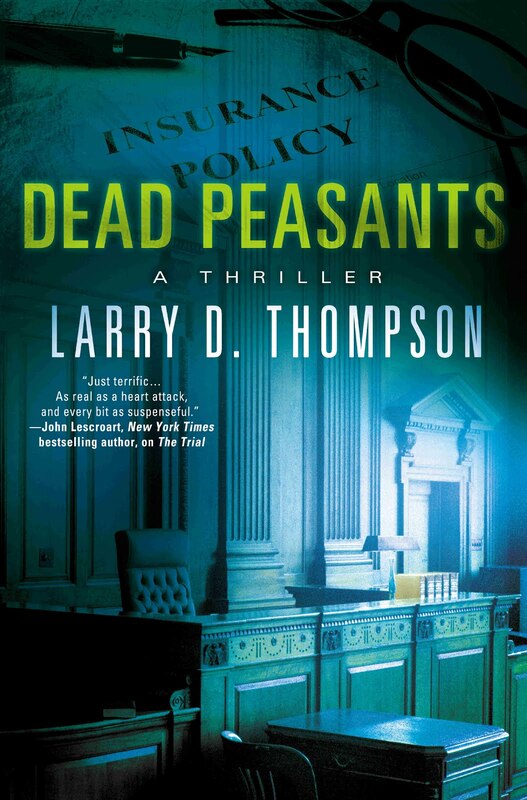 Thank you to Larry Thompson and Partners in Crime Virtual Book Tours for generously offering this book to me for review. If you’d like to join in on an upcoming tour just stop by their sites and sign up today! Jackson Bryant is a successful plaintiff attorney who decides to retire after a multi-million dollar verdict. Attractive realtor Colby Stripling not only sells him his new home, but catches his attention, as well. He takes her advice and begins doing pro bono work for financially disadvantaged clients. When he agrees to help an elderly widow who received a life insurance payment made not to her, but to her husband’s former employer, Jackson finds himself in the middle of a mystery involving a serial killer and murder for hire. First, just let me say this: Wow! I have found a new favorite author. From the first chapter, I began thinking that this guy is the next Grisham. His writing is very similar, with the same pace and storytelling style. Also, the Southern small-town setting with the cunning lawyer who can put on and take off the country-bumpkin persona at will is reminiscent of Grisham’s novels. However, this novel is a bit more gritty than the average legal mystery. If you enjoy legal thrillers, especially those in a Southern setting, you will be hooked from page one. This entry was posted in Uncategorized on July 24, 2013 by theselftaughtcook.